Ivory pearl bow with pearl and rhinestone button on soft elastic bracelet. Pink mink pom poms on a soft elastic bracelet. Off white mink pom poms on a soft elastic bracelet. 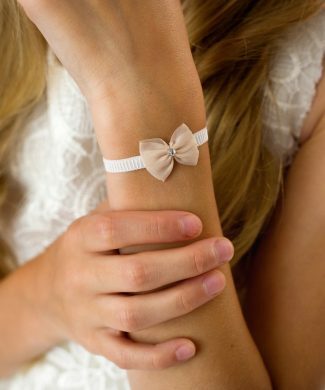 Ivory satin small bow with Swarovski on a soft elastic bracelet.